Once we moved into this house I was often asked when we were going to move Zoey and Nomi into their own room. After 18 months of us all sleeping in the same room/bed we thought it would be a tad cruel to throw them into their own room straight away, and by a tad cruel I mean lots of crying that would stop us bigs having some downtime in the evening. We also had to get the girls to drop bottles of milk and then bottles of water, and once they dropped the bottles of water through out the night the peeing the bed stopped. In typical fashion, everything you think will be a big thing to change isn’t in actual fact a big deal. Dropping bottles was not the end of the world and it was so nice to not have to wash them or have all the parts all over the shop. 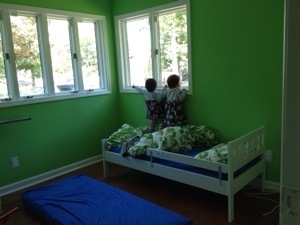 Then over the last few months the girls have spent more time playing in their room-to-be. We took these cues to mean that they were ready, and the move has been really smooth. Only on the first night did Zoey try to drag her bed back into our room. Now, both girls go to sleep in their own room and wake up in our bed in the morning – obviously! When they wake in the night we bring them in with us. At some point they will sleep a full night without waking (or wake and go back to sleep without calling out) but I can’t be bother with back and forth. It’s cute how they draw attention to characters in their books that are asleep in their “own bed”. They don’t quite get the irony that they wake up not in their own bed! Toddler logic at work.